This is one of several raptor companions introduced in patch 3.2. Prior to The Shattering, this pet dropped from Razzashi Raptors in Zul'Gurub. However, the instance was removed, along with these creatures. 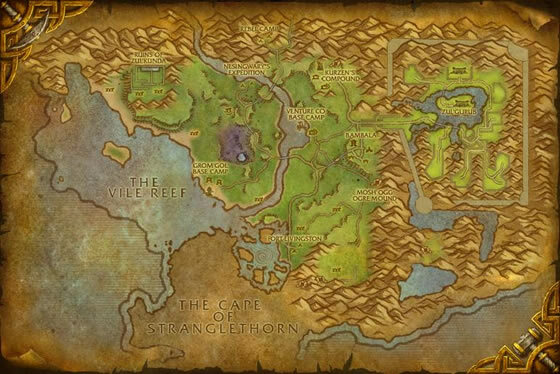 As of Patch 4.0.3, the Razzashi Raptor has become a zone drop from Northern Stranglethorn and The Cape of Stranglethorn. Wait... I'm confused. does the Razzashi hatchling drop from ZG or mobs from STV? or both? got mine yeasterday on the big island in the middle of th vile reef. killing the mobs. I have played at least 4 toons in the cape. Yesterday not even 15 minutes killing for leather he dropped. What a happy early birthday gift. Very specific, but it is possible to obtain this from the phased version of Booty Bay during the Doublerum quest from the bloodsail pirates invading the town, just make sure they're set to "At War" while killing goblins for rep. Easy way to get rep and grinding for the pet done at once. Also should be possible to obtain the Hyacinth Macaw as well from the pirates. Just got mine tonight. Took about 3 or 4 days of consistent farming in one particular area, the cape of staranglethorn near gurubashi area (48.8, 38.3). Kill everything in sight. You'll end up with one. A fun pet, who can increase damage taken and then deal a bit himself. But overall one of the weaker raptor pets and will be killed easily. Razzashi Hatchling might not be the greatest in PvP or against PvE daily tamers, but it's absolutely fabulous when grinding XP for low level pets. It just slaughters critters (go to Valley of the Four Winds) when alternating Bite/Leap and Devour, without being too fragile despite being a P/P. It also helps surprisingly much that its move animations are also quick. So you almost never need to heal and you can use any pet to protect your leveling pet through swaps. Razz will handle the rest! 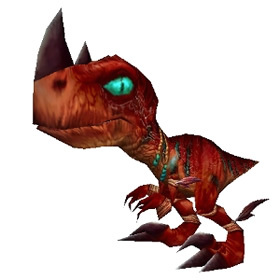 "Regular" raptors are one of those very underused, somewhat bland, pets. This does not mean that they are bad, possibly they are just eclipsed by some fancier pet. The Razzashi Hatchling is the most powerful of these regular Raptors with 325 power. This means both Bite and Flank will do a good amount of damage. Make good use of Screech if you want to get the most out of Flank(except against slow undead). While Exposed Wounds is not as powerful as Black Claw it is still good enough and lasts longer. "Crikey! Would you have look at this li'l beauty! Isn't she gorgeous?" Picked this guy up today i was just questing in sv leveling up when this dropped my tracker says 314 kills woe i feel lucky! Someone was cleaning out their extra pets and put this guy on the AH for only 1K gold. I snatched him up so fast, my head spun. I was 11k kills in, according to Rarity, and no Hatchling or Macaw. Someone who was farming in the area mentioned that he had 2 extra Hatchlings and kindly gave me one! Thank you to Bannik for taking pity on a frustrated pet hunter! Got him today after loot number 5391, off a bloodscalp troll. no macaw yet though. After grinding for him on my main I decided to level my ally noob up in STV. After about an hour of doing quests, this guy drops!!! I was stoked. Well i then was killing gorilla's for the quest from bb and I go to loot one and holy shnikeys, another one had dropped. I was ecstatic. Hopefully I can sell the second for a good amount on my low pop server. I got this little cutie after 108 tries. Now I'm farming for the Hyacinth Macaw. I had attempted farming this pet on and off awhile back with no luck. Now, I often check the AH for good pet deals, and it doesn't happen often where I find one I don't already have. But just now, I checked, and scored this guy for a whopping 1500g. I couldn't even believe my eyes when I saw that. So excited right now. Wish the Fox Kit had been my 150th, but.. Oh well. I'm happy. @Lobbot: Your are mixing things up. You observed the quest series which will lead to the Lashtail Hatchling. I'm a bit confused about this one. I found her wandering as an orphan after killing a Raptor Matriarch. The little raptor appeared at my side on it's own (not as a drop item, she simply went out of the bushes), then followed me back to Grom Gol. There I've received specific missions to pet and feed her. Razzashi raptors are among the cleverest predators in the jungle, making them favored by the Gurubashi trolls.